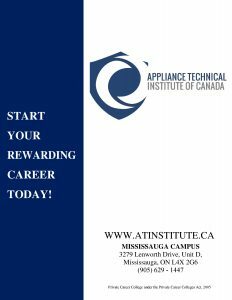 Appliance Technical Institute of Canada’s Mississauga campus is located at 3279 Lenworth Drive, in Unit D.
Students benefit from a spacious learning environment, and a state-of-the-art workshop. Conveniently situated between Mississauga and Etobicoke. The campus is in close proximity to Kipling Station, SmartCentres Mississauga, Cloverdale Mall, Dixie Go Station, Wynn Fitness, and Planet Fitness. The Mississauga campus is highly accessible from Mississauga and Toronto public transit, Highway 401, 403, 427 and QEW, and offers plenty of parking.